BAC Compressor is a leading manufacturers of industrial air compressor, reciprocating compressor, screw compressor, PET compressor, borewell compressor pumps, Air compressor accessories in coimbatore.Quality is the watchword at BAC, and besides adherence to ISO standards,we also adhere to strict internal standards and quality procedures to make sure that we always deliver the best.BAC Compressors has attained stratospheric heights with a production capacity of 8000 compressors per annum. 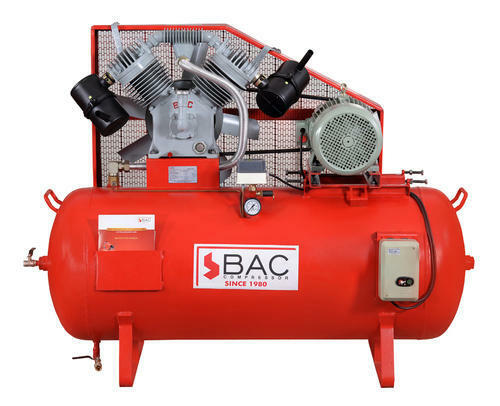 Bac compressor is the best reciprocating air compressor manufacturers. Products include industrial air compressor, PET compressor, borewell compressor pumps in coimbatore.Our reciprocating compressors are manufactured with our own foundry and machining facility and we pour all our castings in-house and do all the machining in-house. Hence, we can give 100% quality assurance for all our components. The very few parts that are not manufactured by us are sourced from the best brands in the industry. Bac Compressor have 30 years of presence in Borewell compressor pumps manufacturers with outstanding performance. Bac Compressors' borewell compressor pumps have been deployed at bore depths of 2000ft and performing effortlessly.BAC Compressors has started it compressor manufacturing history with Borewell Compressor Pumps. BAC has 30+ years of presence in Borewell compressor field so our products are very refined with outstanding performance. Our compressor designs have evolved year after year to adjust to the modern working conditions. Today BAC borewell compressor pumps have been deployed at bore depths of 2000ft and performing effortlessly. Bac compressor a trusted manufacturers of screw air compressor with fully advanced technologies for large industrial applications. Best suppliers of Rotary screw compressor, SD SFVD series screw compressor in Coimbatore. BAC screw compressors are manufactured with very best of time-tested designs and cutting-edge technologies with advanced features that assure reliability, efficiency and endurance of the compressors. BAC Compressors offer two variants of screw compressors, one without VFD called the SD series and one with VFD called SVFD Series. BAC compressors offer one of the industry’s best inefficiencies in screw compressors along with excellent after-sales support. Manufacturers of industrial compressor ranging from 1HP – 20HP. Bac Compressor delivers energy efficient compressor for industrial and commercial use at a very reasonable cost.BAC compressors are very rugged, dependable and have maximum energy efficiency. Loaded with features BAC compressors will deliver a decade-lasting performance at a very reasonable cost. All casting parts are made with high quality graded castings to improve wear resistance and frictional losses. BAC compressors are the finest compressors in the industry.